Seward Moyer Rosenberger: educator, pastor and editor, was born 9 August 1872 in Milford Square, Pennsylvania, the son of Henry H. and Elvina (Moyer) Rosenberger, the eldest of three sons. He died 1 March 1951 in Quakertown, Pennsylvania. Seward was married to Emma Sell on 29 December 1896 at Spinnerstown, Pennsylvania, by A. B. Shelly. She was the daughter of William B. Sell and Catherine (Shelly). Emma died in 1959. 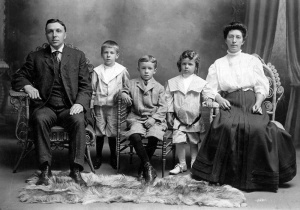 They had four sons—Arthur, Willard, Warren and Edgar. Displaying a keen interest in books and learning, Seward began teaching at the age of 16 and was granted a teacher’s provisional certificate. He subsequently attended West Chester Normal School, and before graduation he was offered the principalship of the Quakertown schools, where he served from 1896-1904. He received a bachelor’s degree from Temple University and a master’s degree from the University of Pennsylvania. In 1905 he began 20 years in the Philadelphia public schools as principal of various schools. During those years, he was an active member of the First Mennonite Church, Philadelphia. Seward took an active role in the formation of the Brotherhood of the General Conference Mennonite Church, later known as the Mennonite Brotherhood. He served as temporary chairman during its organization in 1918, then vice president until 1922, when he became president, serving until 1927. In 1925 he moved to Quakertown and was elected pastor of the Swamp Charge, composed of Bethany, Flatland and West Swamp Mennonite churches. On 12 July 1925 he was ordained, with his son Arthur Rosenberger performing the ordination. Seward resigned the pastorate in 1929 due to ill health. Seward served on the Board of Education of the General Conference Mennonite Church and was assistant editor of the denominational periodical, The Mennonite. With his son Arthur, he co-authored a catechism used for many years by General Conference congregations in preparation for baptism and membership. Seward Rosenberger was devoted to his family and took seriously his responsibility to education and the church. [Rosenberger, Seward M. and Arthur S. Rosenberger]. A Guide to Christian Teaching as Held by Mennonites. Berne, Ind. : Mennonite Book Concern, 1936. Annual Bulletin of the Swamp Mennonite Charge, 1926. Rosenberger, Richard A. "Rosenberger, Seward M. (1872-1951)." Global Anabaptist Mennonite Encyclopedia Online. July 2010. Web. 25 Apr 2019. http://gameo.org/index.php?title=Rosenberger,_Seward_M._(1872-1951)&oldid=143361. Rosenberger, Richard A. (July 2010). Rosenberger, Seward M. (1872-1951). Global Anabaptist Mennonite Encyclopedia Online. Retrieved 25 April 2019, from http://gameo.org/index.php?title=Rosenberger,_Seward_M._(1872-1951)&oldid=143361.